If Natgas Production is Falling, Why Aren’t Natgas Stocks Rising? Has U.S. shale gas production finally stopped growing? According to the EIA’s August Monthly Drilling Productivity Reports (DPR) the answer is yes—even the monster Marcellus play in Pennslvania is rolling over in production–and that should be bullish for natgas stocks in North America. But take that info with a grain of salt–for a couple reasons. One is that because the final production data that comes out of the EIA is good, but their extrapolation (guessing) often isn’t. Since the EIA doesn’t get its final production data until many months after the fact, most of their publications involve a significant amount of guessing. That includes the DPR reporting which in fact is all guesswork (forecasting) since it is forward looking. None of those stock charts given any hint that natural gas pricing is about to turn up. According to the monthly DPRs, U.S. shale production actually started declining in the month of June with a drop of 112 million cubic feet per day. In June, natural gas production dropped from lower associated gas production from the oil plays in the Eagle Ford, Bakken and Niobrara. The DPR for June still showed both the Marcellus and Utica plays growing. 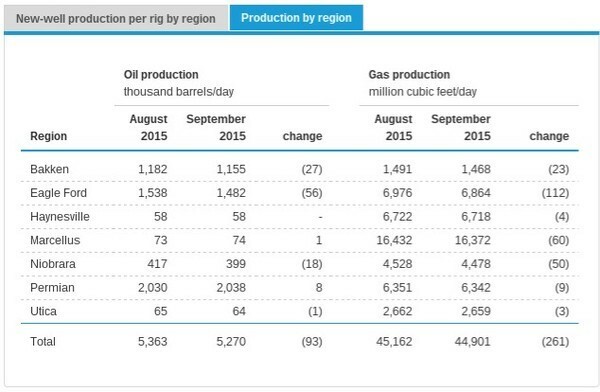 As of the August DPR projections every shale play is showing natural gas production in decline in September. The last play to roll over was the Utica, with all the DPR showing declines in all other shale plays (including the Marcellus) starting in July. The monthly DPRs show that natural gas production from these seven shale regions hit a high of 45.6 billion cubic feet per day in May and will be down to 44.9 billion cubic feet per day in September. That (IF it comes to pass) is a significant 1.5% decrease to U.S. shale production in just four months. There is science behind these projections, as the EIA takes the number of rigs operating in a region and calculates new production based on estimates of productivity per rig. That new production is then matched up with anticipated production declines from already producing wells. Apparently the EIA’s calculations conclude that the amount of new production being brought on no longer exceeds the rate at which legacy wells are declining. So no, it is far too early for dancing bulls. Jack Weixel is VP Analysis at PointLogic Energy, which provides in-depth markets coverage, and trend analysis to oil and gas participants. He says production will ramp up quickly if natgas prices move higher outside the current tight range. “Producers have grown so adept at responding to price, that even the slightest indication of a rise in prices would spur on more drilling and more completions, particularly in the Northeast (Marcellus and Utica—ks). More time is required however, before we can conclude that the EIA’s DPR estimates are accurate. If the Marcellus and Utica have both started declining it will be the most bullish news for natural gas in a long time. Investors often forget that structural demand for natgas has increased dramatically in the last few years, along with the rise in production. While this news does appear to be as yet bullish enough to move natural gas stocks up–it still may be the very thin edge of the wedge of declining US natgas production. As an ending aside, there is one group who believes the DPR–US brokerage firm Credit Suisse. In a September 8 presentation entitled “Markets to Force Production Discipline”, they posit that Year-Over-Year natgas production in the US will be at negative 0.5 bcf/d by mid-November, and negative 4.3 bcf/d by mid March 2016. And while analysts fret if this fall the US will hit the ceiling of its theoretical storage limit of 4.3 TRILLION cubic feet (Tcf), Credit Suisse is projecting next fall there could only be 1 Tcf by November 2016–when withdrawals from storage will happen. There’s an outlier (and very bullish) projection for you. Next post: When I Read The Financials, I Blinked. Twice.